Built exclusively for 7 & 8 string players, the Sentient neck pickup is the perfect neck pickup for natural, complex warmth and tight articulation. With an alnico 5 magnet and medium strength coils, the blend of vintage PAF and modern tones sounds excellent in both clean and high gain settings. 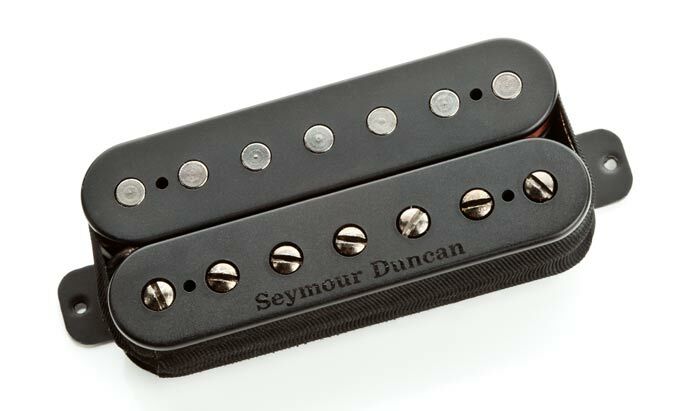 Use with any 7 or 8 string Seymour Duncan bridge pickup. Offered in 7 & 8 string passive mount with naked coils or black metal covers, or in Active 'Soapbar' Mount with exposed adjustable pole pieces. Best with bright to semi-warm woods (from Maple to Korina) with either Maple or Rosewood fingerboards. Denna produkt inkom i vårt sortiment onsdag 21 januari, 2015.